Held in Holmfirth Civic Hall (Huddersfield Road, Holmfirth, HD9 3AS) Holmfirth Artweek 2016 started on Sunday the 3rd of July at 10am and finished on Saturday 9th of July at 5pm. Featuring over 2,000 artworks by over 400 artists (amateur and professional) it is one of the UK’s largest open art exhibitions. Holmfirth Artweek is a fundraising event for Macmillan Cancer Support. All the work is for sale with a minimum of 20% of the price paid going towards the charity. This year was the 50th anniversary too so they wanted to make it an extra special event in celebration. I took part in Holmfirth Artweek for the first time last year (you can see the blog post about it here) and I was pleased to be selected to take part again this year, even more so when I was asked to do a demonstration of how I make my 3D Acrylic Paintings again too. Taking in day was 2pm-6pm on Sunday the 26th of June, so I packed up my 2 3D Acrylic Paintings up safe in bubblewrap (with the labels on that had been requested so I didn’t get put in the naughty corner for getting it wrong) and delivered them to the Civic Hall. I was able to exhibit 2 of my 3D Acrylic paintings in the main hall, I chose “The Flying Scotsman No. 4472” and the “All Saints Church” as they were made in the past year and I wanted to show my newer work. Plus I’m proud of them and wanted people to see them (and maybe even like them enough to buy too). My demonstration was on the Friday, 8th July 2016, from when the hall opened at 10am until it closed at 9pm. I was able to take more of my work to display (and possibly sell) with me along with some kits for people to try the technique for themselves. I also decided that it would be the perfect place to take my new 3D print greetings cards to see what people thought to them. I made up a few things in advance so they were ready to take with me. I wanted to have each stage of the process available to show to people when they asked me about it, along with having pieces to work on when I was there too. The day that I was there seemed to be a bit quiet, the main hall where we were on the stage never seemed to get very full. Although there was a steady trickle of people wondering around most of the time. Those that were looking didn’t really pop up to see us on the stage, and those that did were looking for the market which had moved onto the next floor up. We did still have a few visitors though and I got some nice feedback on my work and new products. I also had a few people sign up to my newsletter, which you can do by clicking here. I really enjoyed getting to watch the other artists that were demonstrating, it’s really interesting to see how other artists work, it was also really nice talking to them about it too. I’ve already been asked to do it again next year, so even though I didn’t sell anything there this year I’m still glad I was able to take part and I’m looking forward to trying again next year. This was my first year submitting to be part of Holmfirth Art Week, I’d been encouraged to give it a try while I was at the Artworld 2 Gallery in Wakefield (which unfortunately closed down at Christmas) and I was pleasantly surprised to be successful and asked to exhibit two of my 3D Acrylic Paintings. I was finding it difficult to choose which two I’d take but thanks to my newsletter subscribers and social media followers/likers “Lancaster Bomber” and “Mummy and Baby African Elephants”‘ were picked. Then as an additional bonus a few weeks before it was due to take place I was given the opportunity to go along on one of the days with more of my work to do a demonstration showing how I make my 3D Acrylic Paintings. These would also be available for sale so I wanted to make the most of this additional opportunity but I didn’t know how much room I was going to have to display them. Fortunately when I was there for taking in day, which was the week before the Art Week started, I was able to see where the demonstrating area was going to be and the size of the board I’d be given to use. So that made it easier for me to try to figure out what to take. I wanted to take a range of different sizes/prices and subject matter to give people an overview of what I can do and hopefully entice them to find out more. I planned on using the larger ones on the board and the smaller ones on the table near to where I’d be demonstrating how to make them. I’d also take along some of the “Make Your Own” starter kits that I’ve been developing for those that are inspired to try it for themselves. 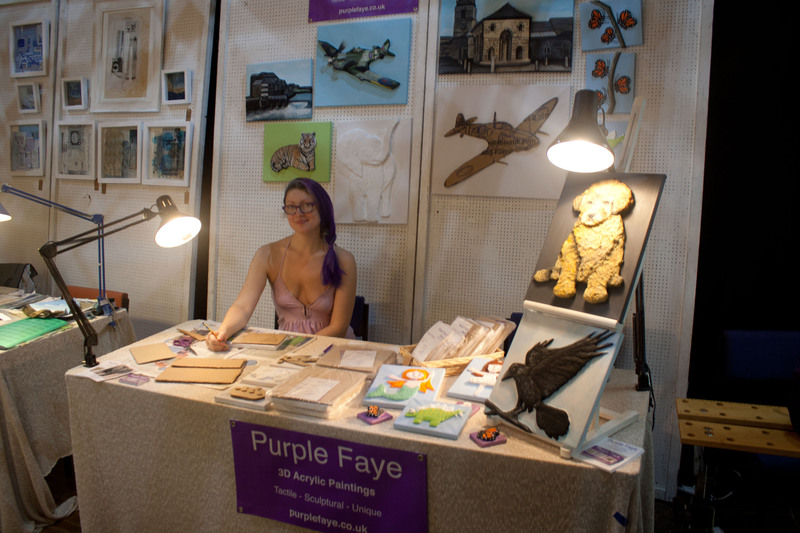 Whenever I’ve done arts and crafts fairs in the past I’ve always struggled with wanting to take everything I’ve got so there’s more chance of someone seeing one that they like enough to buy. Obviously this isn’t very practical or realistic to do but I still can’t help worrying that I’ve picked the wrong ones to take and that if I’d only taken such and such instead they would have sold. This feeling is especially heightened when I’ve not been selling anything. So I was actually quite impressed with myself for only taking a relatively small amount (for me). Along with the finished 3D Acrylic Paintings I wanted to take some that were at different stages of the process so I could show people more easily how they were made. I took some small ones, of a car, boat and plane, that I’d made a while ago for the same purpose of showing people the process when I was at the pop up shop/gallery/studio in Castleford. But I also wanted to take some larger ones to put on the board for people to see from more of a distance too. I decided that I’d make a baby elephant and leave it at the modroc stage so then I could show how the texture is added by the modroc and that I’d make a Spitfire and leave it at the cardboard stage to show how the different layers go together to make it 3D. (You can see them in the picture above). For the demonstration itself I decided that I’d just make a little one from scratch so then it wouldn’t take so long with waiting for things to dry. I picked a highland cow because they’re good for showing how to get texture with the modroc and they’re not too fiddly either. I had planned on completing it but in the end I only got to the modroc stage. It wasn’t quite how I thought it was going to be in terms of it being a demonstration so there weren’t many people who stuck around to watch what I was doing for long. This meant that I ended up waiting for some people to come before doing a bit to show them, then when they went I stopped and waited for more people to come before doing a bit more. So I didnt get to the painting bit. Even though it wasn’t quite what I was expecting it to be I’m still glad that I did it and was even talking to the organiser about doing it again next year (so fingers crossed for that). Unfortunatley I didn’t sell anything while I was there doing the demonstration and when I went on collection day I’d not sold either of the paintings in the exhibition either. I can’t help being disappointed about it but I’m going to keep trying though.